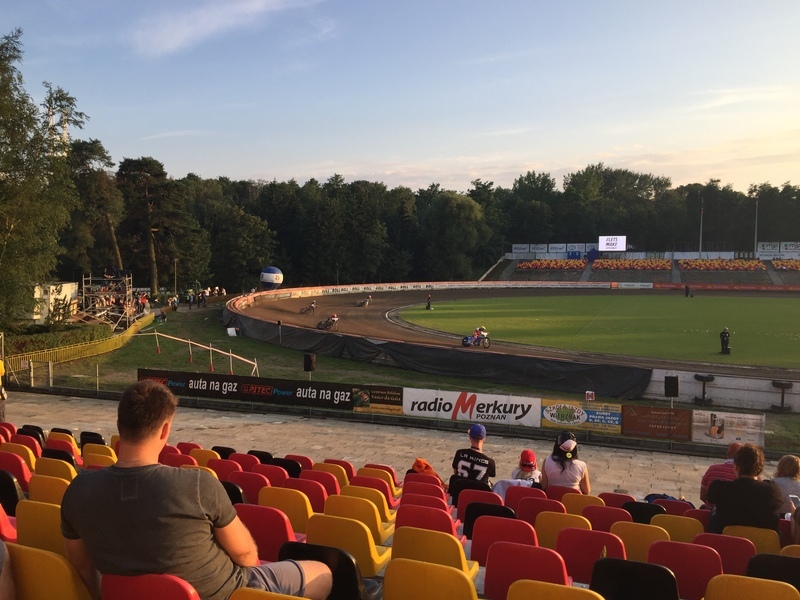 My knowledge about Speedway is minimal so it was quite the surprise for me to see the competitors would be racing on motorbikes, rather than in cars. 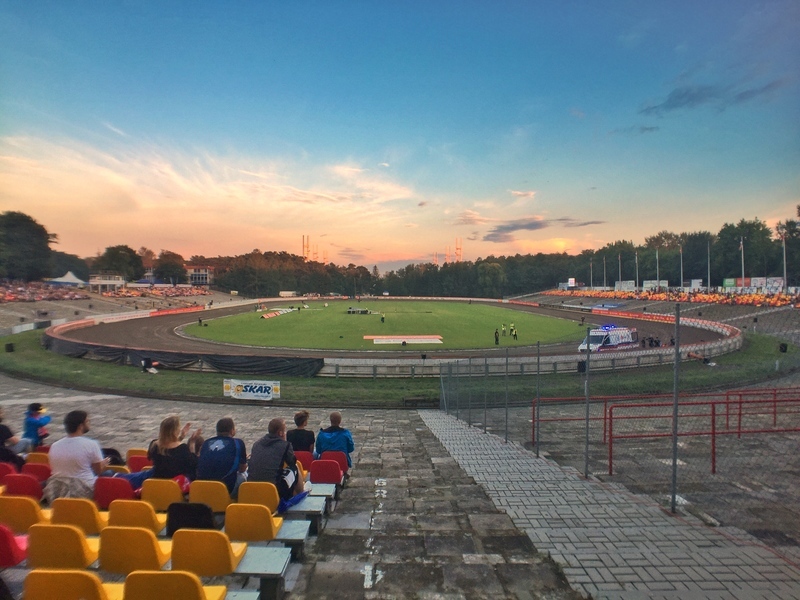 The rain had been intense less than two hours before the U21- World Championship Speedway was due to start at the Poznan speedway track. 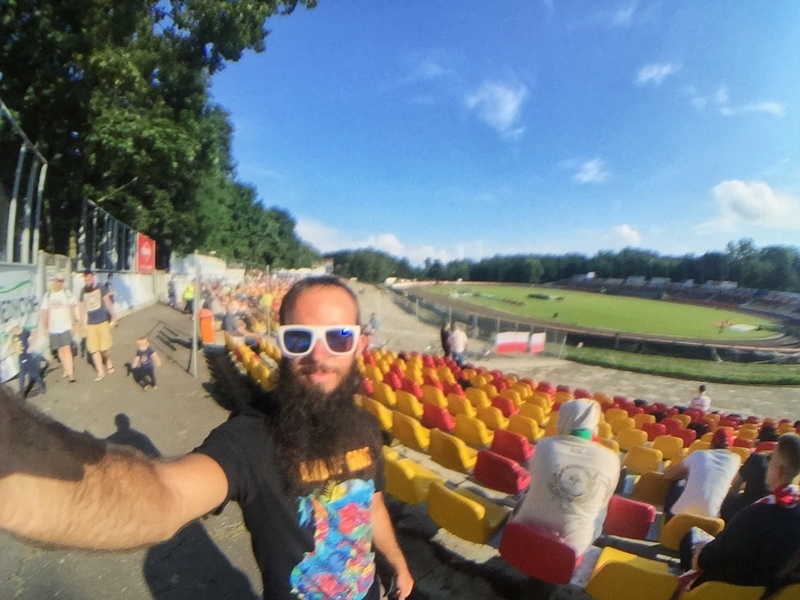 Not knowing if the rain would lead to the event being postponed, I walked towards the track after my stadium tour ready to embrace the Speedway. One of Poland’s most popular sporting passions. The Polish were first introduced to the sport in the 1930’s and have since gone on to have a number of international superstars. 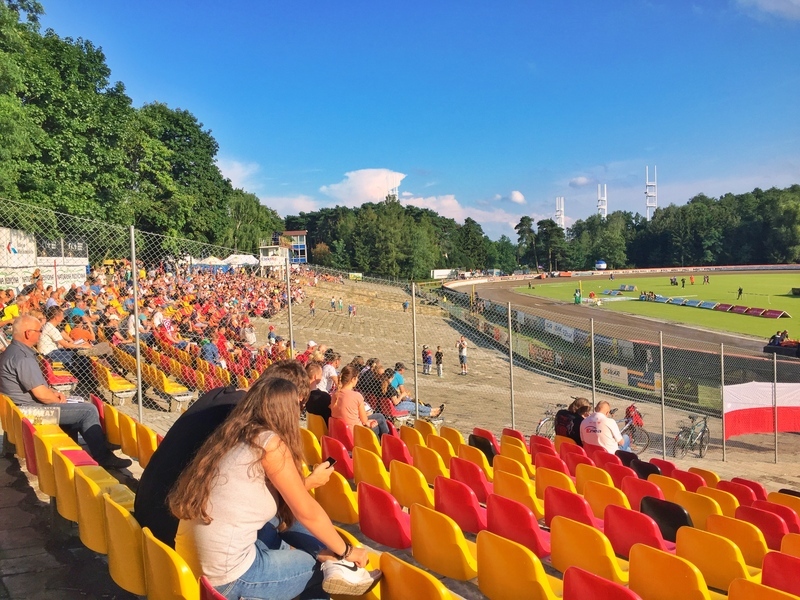 Names like Tomasz Gollob, Andrzej Huszcza, and Rune Holta are names recognised in the Speedway circles around the world. There are a few Polish leagues, with the Ekstraliga the highest profiled attracting international stars. 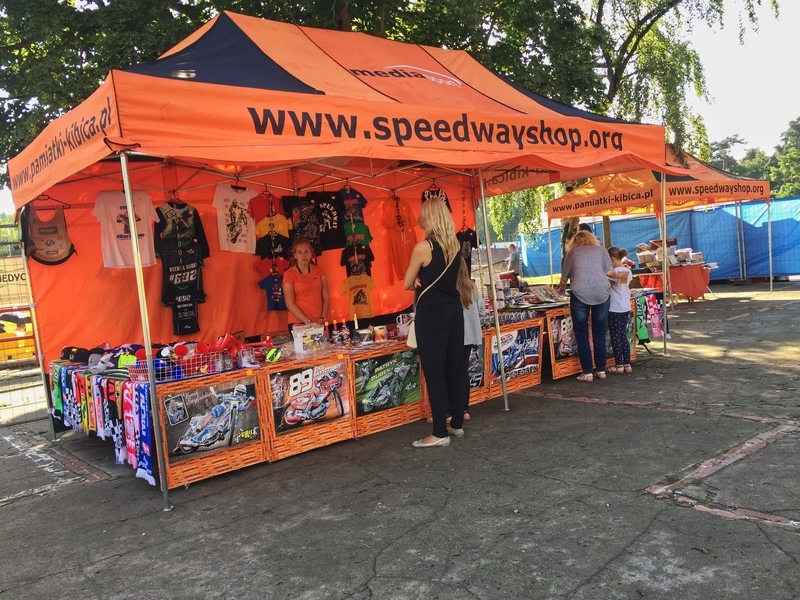 It has also been dubbed the “richest and most popular speedway league in the world”. The Polish fans love it too with consistently good live crowds attending, getting behind both teams and individuals. The U21 Championships have been running in some form since 1977. In 2017, there are three rounds in Poznan, Gustrow, and Pardubice. I’d only discovered the event a day earlier as I scrambled through various Polish websites, relying on Google translate (and Julia) to decipher the Polish dictionary for me. As I got closer to the arena, it was clear the event was going ahead as the sun began to peek through the clouds. 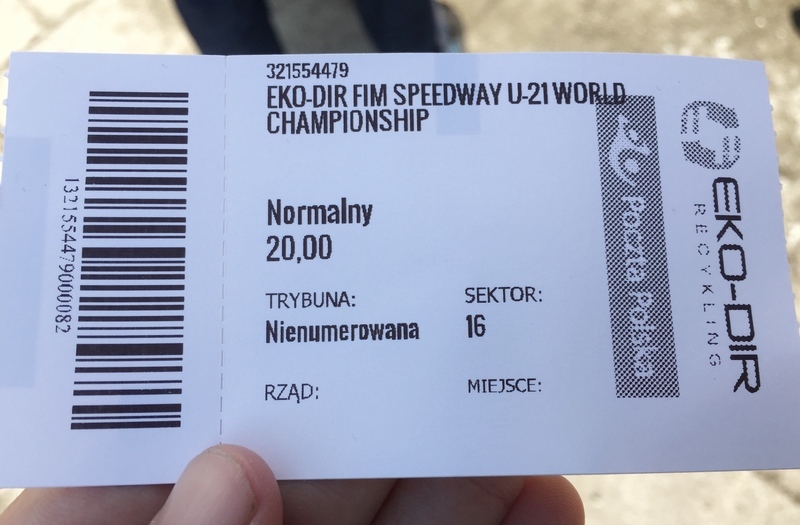 With a 20 zloty ticket, 8 zloty beer, and a 2 zloty donation I found my way to my first seat 50 metres or so in front of the start line. There was both English & Polish spoken over the loud speaker, an unexpected bonus. At least I’d have some idea of what was going on, as we waited for final preparations to finish. The rain must have had some effect as it was announced there was a slight delay while they got the tracks perfect. I peered over the shoulders of others (with minimal levels of creepiness) to read the program and figure out the schedule. Speaking to Dad afterward, this is more or less a pretty standard Speedway format. As my knowledge about Poland begins to grow, I wasn’t surprised to see seven of the riders were Polish. 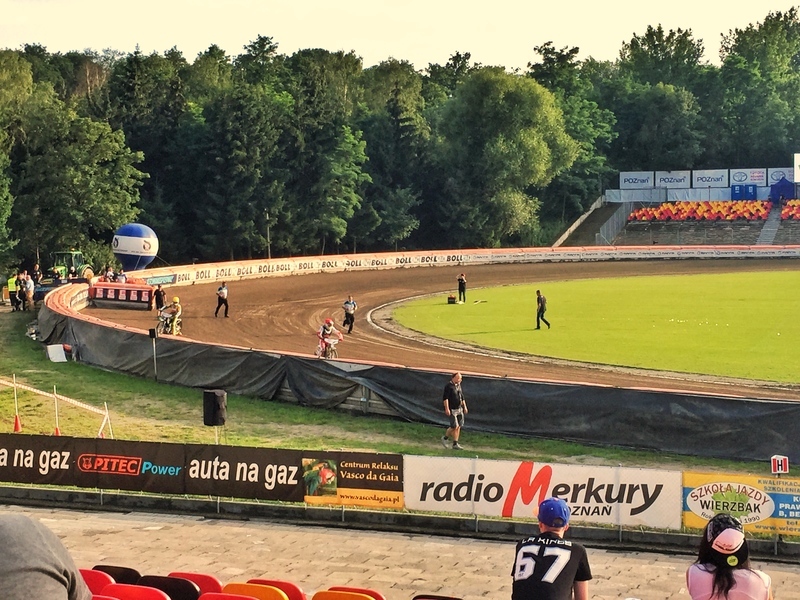 I have no idea if home track advantage in Speedway is a thing but the Polish would obviously want to start the championship strongly. These riders are still under 21 years of age. While the gorgeous girls holding the signs might have been a distraction, I think it was more the pressure that got to a couple riders who jumped the gun. Just like you see in the Olympics 100m sprint, all the training in the world can’t replicate the biggest sporting event of the year. Eventually there was some rhythm to the heats, with a winning heat time in 65-68 second mark. I figured out the start was crucial. Very rarely was the front runner overtaken as riders positioned themselves during the first 200 metres on the first lap. There were a few crashes, nothing big thankfully. All the crashes were on the same end of the track, not sure what to read into that? There were no major injuries, win. I pottered around to different sections of the seating, trying to observe different things that were happening around the event. The Polish national anthem was sung with such pride before the event kicked off. Reminding me of Thailand movie theatres. Beers, babes, and bikes. The three pillars of a stereotypical motorsport event were present. Beers were 8 zloty (400 ml), very reasonable for a live sporting event. The crowd was a large variety of people, young, old, male, female, groups, solo watchers and families. The pesky horns that billow sound aren’t all that distracting. They crowd were very appreciative, clapping when winners were announced & those who crashed had risen to their feet. Some fans were super passionate, riding every corner from the edge of their seat. They’re always fun to watch. As sunset was nearing, there were no floodlights over the stadium so I got the feeling they were trying to push the races through slightly quicker. The final race was a hometown dream. Three Polish riders and the lone Latvian. Defending champion Max Fricke not qualifying through his semifinal after winning most of his races earlier in the day. 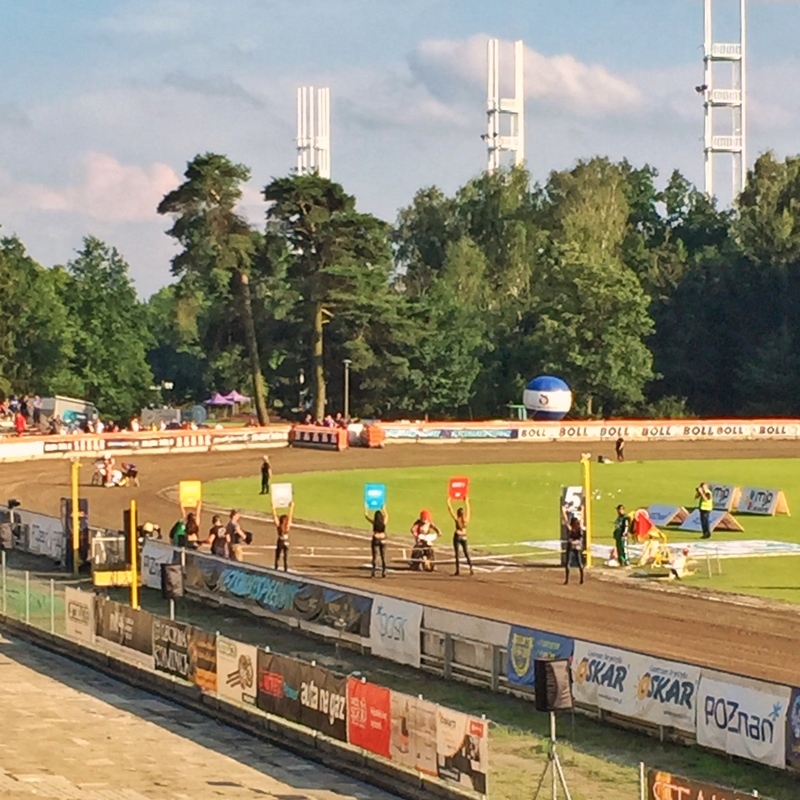 The crowd favourite, Maksym Drabik, who had won all his races for the day got off to the best start and won comfortably with Polish Bartosz Smektała and Latvian Jevgenij Kostigov making the podium. Noticeable, finishing in the same positions, they were in after the first half a lap. The day out at the speedway was brilliant. The crowds were respectful, fun and everyone seemed to be enjoying themselves, hanging around until the final race. 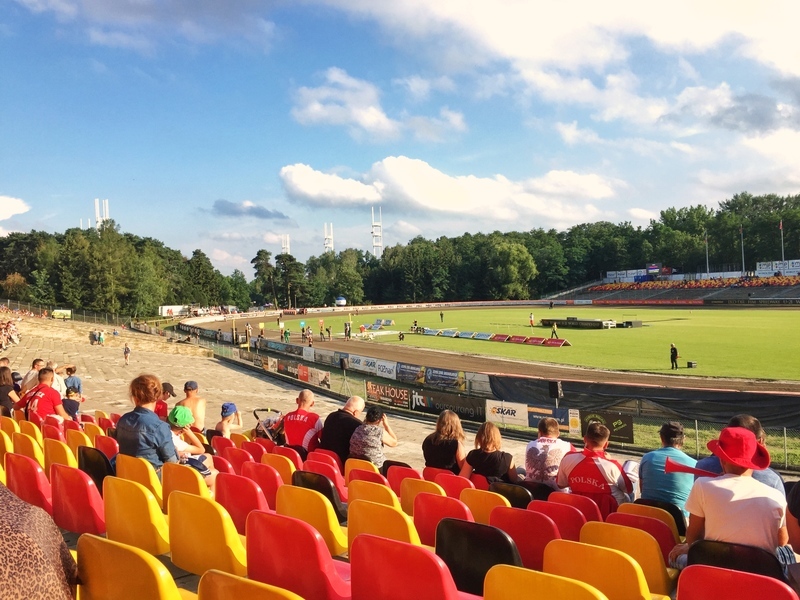 If you happen to be in a Polish city when there’s a speedway event happening, I’d highly recommend heading along. I’m not sure if all events go on like this, but the event was scheduled to start at 5 pm and everything was finished by 8.45pm. An awesome few hours. Interestingly enough, this was a comment a few weeks later in a Facebook group where this post was shared. Yay for ignorance.